What is the origin of the large Isidis Planitia, on Mars? The characterization of an impact crater requires an understanding of the impact phenomena, considering the properties of the materials involved in the impact. The size and energy of the projectile control the width and depth of the crater. Related to impact craters is the formation of mass concentrations, or mascons, which produce intense positive gravity anomalies. 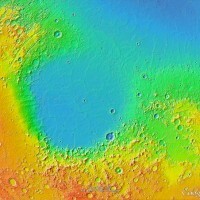 One of the largest mascons is in the Isidis Planitia, Mars. Using the finite element code iSALE hydrocode, we modelled the impact event that originated the Isidis basin, on Mars. We studied the evolution of the materials shocked and melted by the impact. We obtained the lithospheric structure, an input for our model, through a bottom-load flexure model constrained to fit the calculated admittance, which we estimated from gravity and topography remotely sensed data in the spectral domain. The flexural models allow retrieving the elastic and crustal thickness, the thermal gradient, and the heat flux under the assumption that (i) the observed gravity signature that represents the mascon is related to the impact event, and its following evolution, and (ii) the achievement of the present state was influenced by the thermal and the flexural evolution of the lithosphere. We obtained our best-fit admittance model with a 10 km thick, thin crust formed likely by cooling of the superficial melt pool after the impact, and an elastic thickness of 36 km. Our impact model revealed that a 50-km diameter projectile caused the impact that formed the Isidis basin, producing crustal excavation, crustal thickening, and topographic signatures compatible with the existing mascon. The evolution of the melt pool after the impact was likely characterised by an isostatic adjustment controlled by the viscosity and strength of the crust and the mantle involved in the deformation. The superficial melt pool formed with temperatures higher than 1500 °K, and is observed only beneath the area covered by the free-air anomaly maxima. The geometry resulting from the impact modelling is compatible with the radius of the Isidis basin. The obtained thermal gradient and heat flux are in agreement with an early-Noachian epoch (four billion years) for the impact, and with the intense volcanic activity that followed. Mancinelli P, Mondini AC, Pauselli C, Federico C. 2015. 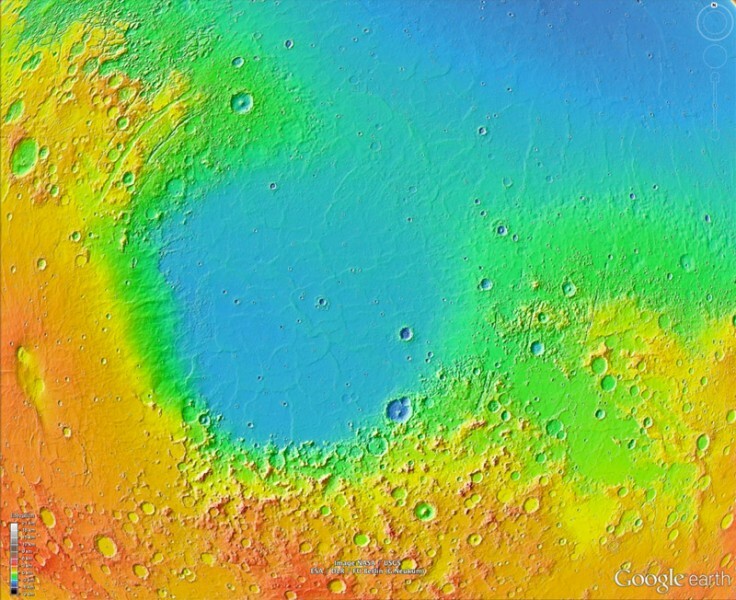 Impact and admittance modeling of the Isidis Planitia, Mars. Planetary and Space Science. DOI: 10.1016/j.pss.2015.04.019.